On a Friday night in deepest winter, the residents of the remote, mythical town of Almost, Maine (so far north it's almost in Canada) are falling in and out of love in unexpected, unusual, and often hilarious ways. As the northern lights hover magically overhead, knees are getting bruised, and hearts are getting broken. But the bruises heal and hearts mend -- almost -- in this delightful romantic comedy. This is a first play for playwright, John Cariani. Cariani is also an actor and is best known for his role as CSU Tech Julian Beck on television's Law & Order. 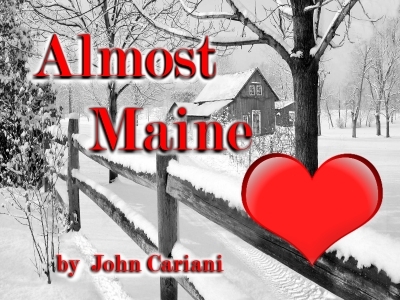 The inspiration for ALMOST, MAINE is rooted in Cariani’s experience growing up in his hometown of Presque Isle in Northern Maine.